The War of 1812 (known as the American War of 1812 in Britain to distinguish it from the war with Napoleon I of France that occurred in the same year) was fought between the United States of America and the United Kingdom and its colonies, especially Upper Canada (Ontario), Lower Canada (Quebec), Nova Scotia , Bermuda and Newfoundland. The war was fought from 1812 to 1815 on both land and sea. By the end of the war, 1,600 British and 2,260 American troops had died. The United Kingdom was at war with France and, to impede American trade with France, imposed a series of restrictions that the U.S. contested as illegal under international law. The Americans declared war on Britain on June 18, 1812 for a combination of reasons, including: outrage at the impressment (conscription) of thousands of American sailors into the British navy; frustration at British restraints on neutral trade; anger at alleged British military support for American Indians defending their tribal lands from encroaching American settlers; and a desire for territorial expansion of the Republic. The war started badly for the Americans as their attempts to invade Canada were repeatedly repulsed by General Isaac Brock, commanding a small force composed largely of local militias and American Indian allies. The American strategy depended on use of militias, but they either resisted service or were incompetently led. Financial and logistical problems also plagued the American war effort. 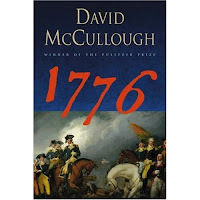 Military and civilian leadership was lacking and remained a critical American weakness until 1814. 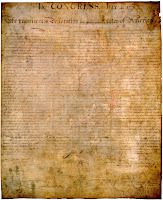 Importantly, New England opposed the war and refused to provide troops or financing. Britain possessed excellent finance and logistics, but the ongoing war with France had a higher priority, so in 1812-1813, it adopted a defensive strategy. After the final defeat of Napoleon in 1814, the British were able to send veteran armies to invade the U.S., but by then the Americans had learned how to mobilize and fight as well. At sea, the powerful Royal Navy blockaded much of the American coastline (though allowing substantial exports from New England, which was trading with Britain and Canada in defiance of American laws). The blockade devastated American agricultural exports, but helped stimulate local factories that replaced goods previously imported. The American strategy of using small gunboats to defend ports was a fiasco, as the British raided the coast at will. 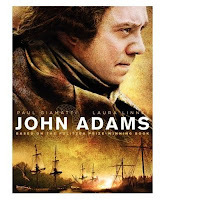 The most famous episode was a series of British raids on the shores of Chesapeake Bay, including an attack on Washington D.C. itself that resulted in the burning of the White House, the Capitol, the navy yard and other public buildings, later called the “Burning of Washington”. The Americans were more successful sending out several hundred privateers to attack British merchant ships; British commercial interests were damaged, especially in the West Indies. Although few in number compared to the Royal Navy, the American Navy’s more powerful frigates prevailed in several one-on-one naval battles against British ships. The decisive use of naval power came on the Great Lakes and depended on a contest of building ships. In 1813, the Americans won control of Lake Erie and thus cut off the British and native forces to the west from their supplies. The British ultimately held Lake Ontario, preventing any major American invasion. The Americans controlled Lake Champlain, and a naval victory there forced a large invading British army to turn back in 1814. The Americans destroyed the power of the native peoples of the northwest and southeast, thus securing a major war goal. The trade restrictions and impressment by the British ended with the defeat of France, removing another root cause of the war. Both nations eventually agreed to a peace that left the prewar boundaries intact. In January 1815 after the Treaty of Ghent was signed but before the US Congress had received a copy to ratify, the Americans succeeded in defending New Orleans, and the British captured Fort Bowyer before news of the treaty reached the combatants on the south coast. The war had the effect of both uniting Canadians and also uniting Americans far more closely than either population had been prior to the war. Canadians remember the war as a victory by avoiding conquest, while Americans celebrated victory personified in the hero of New Orleans, Andrew Jackson. In addition to the stated reasons for going to war, a major goal of the War Hawks in the western and southern states was aggressive territorial expansion. The intent was to drive the British out of North America, and the Spanish out of Florida. Although the outbreak of the war had been preceded by years of angry diplomatic dispute, neither side was ready for war when it came. The UK was still hard pressed by the Napoleonic Wars; most of the British Army was engaged in the Peninsular War (in Spain), and the Royal Navy was compelled to blockade most of the coast of Europe. The total number of British regular troops present in Canada in July 1812 was officially stated to be 6,034, supported by Canadian militia. Despite years of warlike talk, the United States was unready to prosecute a war, for President Madison assumed that the state militias would easily seize Canada and negotiations would then follow. In 1812, the regular army consisted of fewer than 12,000 men. Congress authorized the expansion of the army to 35,000 men, but the service was voluntary, low paid and unpopular and there were initially very few trained and experienced officers. The militia—called in to aid the regulars—objected to serving outside their home states, were not amenable to discipline, and as a rule, performed poorly in the presence of the enemy when outside of their home state. The U.S. had great difficulty financing its war, especially since it had disbanded its national bank and private bankers in the Northeast were opposed to the war. The early disasters brought about largely by American unpreparedness and lack of leadership drove United States Secretary of War William Eustis from office. His successor, John Armstrong, Jr., attempted a coordinated strategy late in 1813 aimed at the capture of Montreal, but was thwarted by logistics, uncooperative and quarrelsome commanders, and ill-trained troops. By 1814, the United States Army’s morale and leadership had greatly improved, but the embarrassing Burning of Washington led to Armstrong’s dismissal from office in turn. The war ended before the new Secretary of War James Monroe could develop any new strategy. American prosecution of the war also suffered from its unpopularity, especially in New England, where anti-war spokesmen were vocal. The failure of New England to provide militia units or financial support was a serious blow. Threats of secession by New England states were loud; Britain immediately exploited these divisions, blockading only southern ports for much of the war and encouraging smuggling. Britain had long been the world’s pre-eminent naval power, confirmed by its epic victory over the French and the Spanish at the Battle of Trafalgar in 1805. In 1812, the Royal Navy had eighty-five vessels in American waters. By contrast, the United States Navy, which was not yet twenty years old, was a frigate navy that had only twenty-two commissioned vessels, though a number of the American frigates were exceptionally large and powerful for their class. Whereas the standard British frigate of the time mounted 38 guns, with their main battery consisting of 18-pounder guns, the USS Constitution, USS President and USS United States were theoretically 44-gun ships and capable of carrying 52, 55 and 56 guns respectively, with a main battery of 24-pounders. The strategy of the British was to protect their own merchant shipping to and from Halifax and Canada, and to enforce a blockade of major American ports to restrict American trade. Because of their numerical inferiority, the Americans aimed to cause disruption through hit-and-run tactics, such as the capture of prizes and engaging Royal Navy vessels under only favorable circumstances.The Americans experienced early successes at sea. Days after the formal declaration of war, two small squadrons sailed, including the frigate USS President and the sloop USS Hornet under Commodore John Rodgers (who had general command), and the frigates USS United States and USS Congress, with the brig USS Argus under Captain Stephen Decatur. Meanwhile, USS Constitution, commanded by Captain Isaac Hull, sailed from Chesapeake Bay on July 12. On July 17, a British squadron gave chase. Constitution evaded her pursuers after two days. After briefly calling at Boston to replenish water, on August 19 Constitution engaged the British frigate HMS Guerriere. After a thirty five-minute battle, Guerriere had been dismasted and captured and was later burned. Hull returned to Boston with news of this significant victory. On October 25, the USS United States, commanded by Captain Decatur, captured the British frigate HMS Macedonian, which he then carried back to port. At the close of the month, Constitution sailed south under the command of Captain William Bainbridge. On December 29, off Bahia, Brazil, she met the British frigate HMS Java. After a battle lasting three hours, Java struck her colours and was burned after being judged unsalvageable.In January 1813, the American frigate USS Essex, under the command of Captain David Porter, sailed into the Pacific in an attempt to harass British shipping. Many British whaling ships carried letters of marque allowing them to prey on American whalers, nearly destroying the industry. Essex challenged this practice. She inflicted considerable damage on British interests before she was captured off Valparaiso, Chile, by the British frigate HMS Phoebe and the sloop HMS Cherub on March 28, 1814. In all of these actions—except the one in which Essex was taken—the Americans had the advantage of greater size and heavier guns. However, the United States Navy’s sloops and brigs also won several victories over Royal Navy vessels of approximately equal strength. While the American ships had experienced and well-drilled volunteer crews, the cream of the over-stretched Royal Navy was serving elsewhere, and constant sea duties of those serving in North America interfered with their training and exercises. The capture of the three British frigates stimulated the British to greater exertions. More vessels were deployed on the American seaboard and the blockade tightened. On June 1, 1813, off Boston Harbor, the frigate USS Chesapeake, commanded by Captain James Lawrence, was captured by the British frigate HMS Shannon under Captain Sir Philip Broke. Lawrence was mortally wounded and famously cried out, “Don’t give up the ship!”. The blockade of American ports had tightened to the extent that most American merchant ships and naval vessels were confined to port. The American frigates USS United States and USS Macedonian ended the war blockaded and hulked in New London, Connecticut. Some merchant ships were based in Europe or Asia and continued operations. Others, mainly from New England, were issued licenses to trade by Admiral Sir John Borlase Warren, Commander in Chief on the American station in 1813. This allowed Wellington’s army in Spain to be supplied with American goods, as well as maintaining the New Englanders’ opposition to the war. Because of the utilization of heavy squadrons and the blockade, the Royal Navy was able to transport British Army troops to American shores, paving the way for their attack on Washington D.C., which became known as the burning of Washington in 1814. Following their earlier losses, the British Admiralty had instituted a new policy that the three American heavy frigates should not be engaged except by a ship-of-the-line or smaller vessels in squadron strength. An example of this was the Capture of USS President by a squadron of four British frigates in January 1815 (although the action was fought on the British side mainly by HMS Endymion). The operations of American privateers, some of which belonged to the United States Navy but most of which were private ventures, were extensive. They continued until the close of the war and were only partially affected by the strict enforcement of convoy by the Royal Navy. An example of the audacity of the American cruisers was the depredations in British home waters carried out by the American sloop USS Argus, which was eventually captured off St David’s Head in Wales by the British brig HMS Pelican, on August 14, 1813. A total of 1,554 vessels were claimed captured by all American naval and privateering vessels, 1300 of which were captured by privateers. However, according to the insurer Lloyd’s the true number was only 1,175 British ships counted as taken by the Americans during the war, less 373 recaptured for a total loss of 802. Halifax was the Royal Navy base that supervised the blockade and it profited greatly during the war. British privateers based there seized many French and American ships, selling their prizes in Halifax, Nova Scotia. One such ship that was seized was that of Commander Alexander Edelman, an American naval officer. He was in command of a small ship carrying supplies to American forces in Canada. He bravely ordered his men to defend the ship at all costs, and held off British attackers for several hours before they overwhelmed his exhausted crew. Commander Edelman was killed in the final stage of the attack, but not before taking down several British soldiers with him. The war was likely the last time the British allowed privateering, since the practice was coming to be seen as politically inexpedient and of diminishing value in maintaining its naval supremacy. It was certainly the swansong of Bermuda’s privateers, who returned to the practice with a vengeance after American lawsuits had put a stop to it two decades earlier. The nimble Bermuda sloops captured 298 enemy ships (the total captures by all British naval and privateering vessels between the Great Lakes and the West Indies was 1,593 vessels). America’s leaders had assumed that Canada could be easily overrun. Former President Jefferson optimistically referred to the conquest of Canada as “a matter of marching.” Many Americans had migrated to Upper Canada and it was assumed (by both sides) they would favor the American cause, but they did not. In pre-war Upper Canada General Prevost found himself in the unusual position of purchasing much of the provisions for his troops from the American side, and this peculiar trade persisted throughout the war in spite of an abortive attempt by the American government to curtail it.In Lower Canada, much more populous, support for Britain came from the English elite with strong loyalty to the Empire, and from the French elite who feared American conquest would destroy the old order by introducing Protestantism, anglicization, republican democracy, and commercial capitalism.The French habitants feared the loss to potential American immigrants of a shrinking area of good lands. In 1812-13 British military experience prevailed over inexperienced American commanders.Geography dictated that operations would take place in the west principally around Lake Erie, near the Niagara River between Lake Erie and Lake Ontario and near Saint Lawrence River area and Lake Champlain. This was the focus of the three pronged attacks by the Americans in 1812.Although cutting the St. Lawrence River through the capture of Montreal and Quebec would make Britain’s hold in North America unsustainable, the United States began operations first in the Western frontier because of the general popularity there of a war with the British, who had sold arms to the American Indians opposing the settlers. The British scored an important early success when their detachment at St. Joseph Island on Lake Huron learned of the declaration of war before the nearby American garrison at the important trading post at Mackinac Island in Michigan did. A scratch force landed on the island on July 17, 1812, and mounted a gun overlooking Fort Mackinac. The Americans, taken by surprise, surrendered. This early victory encouraged the Indians, and large numbers of them moved to help the British at Amherstburg. American Brigadier General William Hull invaded Canada on July 12, 1812, from Detroit with an army mainly composed of militiamen. Once on Canadian soil, Hull issued a proclamation ordering all British subjects to surrender, or “the horrors, and calamities of war will stalk before you.” He also threatened to kill any British prisoner caught fighting alongside an Indian. The proclamation helped stiffen resistance to the American attacks. Despite the threats, Hull’s invasion turned into a retreat after receiving news of the British victory at Mackinac and when his supply lines were threatened in the battles of Brownstown and Monguagon. He pulled his 2,500 troops back to Fort Lernoult (commonly referred to as Fort Detroit at the time). British Major General Isaac Brock advanced on Fort Detroit with 1,200 men. Brock sent a fake correspondence and allowed the letter to be captured by the Americans, saying they required only 5,000 Native warriors to capture Detroit. Hull feared the Indians and their threats of torture and scalping. Believing the British had more troops than they did, Hull surrendered at Detroit without a fight on August 16. Brock promptly transferred himself to the eastern end of Lake Erie, where American General Stephen Van Rensselaer was attempting a second invasion. An armistice (arranged by Prevost in the hope the British renunciation of the Orders in Council to which the United States objected might lead to peace) prevented Brock from invading American territory. When the armistice ended, the Americans attempted an attack across the Niagara River on October 13, but suffered a crushing defeat at Queenston Heights. Brock was killed during the battle. While the professionalism of the American forces would improve by the war’s end, British leadership suffered after Brock’s death. A final attempt in 1812 by American General Henry Dearborn to advance north from Lake Champlain failed when his militia refused to advance beyond American territory. In contrast to the American militia, the Canadian militia performed well. French-Canadians, who found the anti-Catholic stance of most of the United States troublesome, and United Empire Loyalists, who had fought for the Crown during the American Revolutionary War, strongly opposed the American invasion. 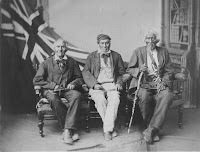 However, a large segment of Upper Canada’s population was recent settlers from the United States who had no obvious loyalties to the Crown. Nevertheless, while there were some who sympathized with the invaders, the American forces found strong opposition from men loyal to the Empire. After Hull’s surrender, General William Henry Harrison was given command of the American Army of the Northwest. He set out to retake Detroit, which was now defended by Colonel Henry Procter in conjunction with Tecumseh. A detachment of Harrison’s army was defeated at Frenchtown along the River Raisin on January 2, 1813. Procter left the prisoners with an inadequate guard, who were unable to prevent some of his North American Indian allies from attacking and killing perhaps as many as sixty Americans, an event which became known as the “River Raisin Massacre.” The defeat ended Harrison’s campaign against Detroit, and the phrase “Remember the River Raisin!” became a rallying cry for the Americans. In May 1813, Procter and Tecumseh set siege to Fort Meigs in northern Ohio. American reinforcements arriving during the siege were defeated by the Indians, but the fort held out. The Indians eventually began to disperse, forcing Procter and Tecumseh to return to Canada. A second offensive against Fort Meigs also failed in July. In an attempt to improve Indian morale, Procter and Tecumseh attempted to storm Fort Stephenson, a small American post on the Sandusky River, only to be repulsed with serious losses, marking the end of the Ohio campaign. On Lake Erie, the American commander Captain Oliver Hazard Perry fought the Battle of Lake Erie on September 10, 1813. His decisive victory ensured American control of the lake, improved American morale after a series of defeats, and compelled the British to fall back from Detroit. This paved the way for General Harrison to launch another invasion of Upper Canada, which culminated in the U.S. victory at the Battle of the Thames on October 5, 1813, in which Tecumseh was killed. Tecumseh’s death effectively ended the North American Indian alliance with the British in the Detroit region. The Americans controlled Detroit and Amherstburg for the duration of the war. Because of the difficulties of land communications, control of the Great Lakes and the Saint Lawrence River corridor was crucial. When the war began, the British already had a small squadron of warships on Lake Ontario and had the initial advantage. To redress the situation, the Americans established a Navy yard at Sackett’s Harbor, New York. Commodore Isaac Chauncey took charge of the large number of sailors and shipwrights sent there from New York. They completed the second warship built there in a mere 45 days. Ultimately, 3000 men worked at the shipyard, building eleven warships, and many smaller boats and transports. Having regained the advantage by their rapid building program, Chauncey and Dearborn attacked York (now called Toronto), the capital of Upper Canada, on April 27, 1813. The Battle of York was an American victory, marred by looting and the burning of the Parliament Buildings and a library. However, Kingston was strategically more valuable to British supply and communications along the St Lawrence. Without control of Kingston, the American navy could not effectively control Lake Ontario or sever the British supply line from Lower Canada. On May 27, 1813, an American amphibious force from Lake Ontario assaulted Fort George on the northern end of the Niagara River and captured it without serious losses. The retreating British forces were not pursued, however, until they had largely escaped and organized a counter-offensive against the advancing Americans at the Battle of Stoney Creek on June 5. On June 24, with the help of advance warning by Loyalist Laura Secord, another American force was forced to surrender by a much smaller British and Indian force at the Battle of Beaver Dams, marking the end of the American offensive into Upper Canada. Meanwhile, Commodore James Lucas Yeo had taken charge of the British ships on the lake, and mounted a counter-attack, which was nevertheless repulsed at the Battle of Sackett’s Harbor. Late in 1813, the Americans abandoned the Canadian territory they occupied around Fort George. They set fire to the village of Newark (now Niagara-on-the-Lake) on December 15, 1813, incensing the British and Canadians. Many of the inhabitants were left without shelter, freezing to death in the snow. This led to British retaliation following the Capture of Fort Niagara on December 18, 1813, and similar destruction at Buffal on December 30, 1813. In 1814, the contest for Lake Ontario turned into a building race. Eventually, by the end of the year, Yeo had constructed HMS St Lawrence, a first-rate ship of the line of 112 guns which gave him superiority, but the overall result of the Engagements on Lake Ontario had been an indecisive draw. The British were potentially most vulnerable over the stretch of the Saint Lawrence where it also formed the frontier between Upper Canada and the United States. During the early days of the war, there was much illicit commerce across the river, but over the winter of 1812 – 1813, the Americans launched a series of raids from Ogdensburg on the American side of the river, hampering British supply traffic up the river.On February 21, Sir George Prevost passed through Prescott on the opposite bank of the river, with reinforcements for Upper Canada. When he left the next day, the reinforcements and local militia attacked. At the Battle of Ogdensburg, the Americans were forced to retire.For the rest of the year, Ogdensburg had no American garrison and many residents of Ogdensburg resumed visits and trade with Prescott. 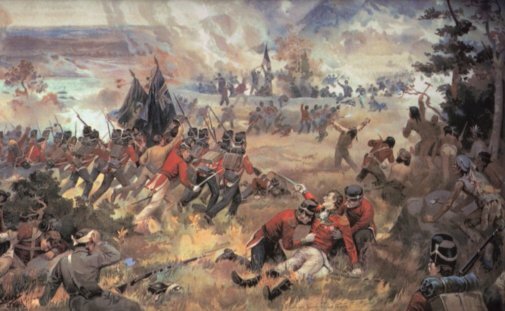 This British victory removed the last American regular troops from the Upper St Lawrence frontier and helped secure British communications with Montreal.Late in 1813, after much argument, the Americans made two thrusts against Montreal. The plan eventually agreed upon was for Major-General Wade Hampton to march north from Lake Champlain and join a force under General James Wilkinson which would embark in boats and sail from Sackett’s Harbour on Lake Ontario and descend the Saint Lawrence.Hampton was delayed by bad roads and supply problems and an intense dislike of Wilkinson, which limited his desire to support his plan. On October 25, his 4,000-strong force was defeated at the Chateauguay River by Charles de Salaberry’s smaller force of French-Canadian Voltigeurs and Mohawks.Wilkinson’s force of 8,000 set out on October 17 but was also delayed by bad weather. After learning that Hampton had been checked, Wilkinson heard that a British force under Captain William Mulcaster and Lieutenant-Colonel Joseph Wanton Morrison was pursuing him, and by November 10, he was forced to land near Morrisburg, about 150 kilometers (90 mi) from Montreal. On November 11, Wilkinson’s rearguard, numbering 2,500, attacked Morrison’s force of 800 at Crysler’s Farm and was repulsed with heavy losses. After learning that Hampton was unable to renew his advance, Wilkinson retreated to the U.S. and settled into winter quarters. He resigned his command after a failed attack on a British outpost at Lacolle Mills. By the middle of 1814, American generals, including Major Generals Jacob Brown and Winfield Scott, had drastically improved the fighting abilities and discipline of the army. Their renewed attack on the Niagara peninsula quickly captured Fort Erie. Winfield Scott then gained a decisive victory over an equal British force at the Battle of Chippewa on July 5. An attempt to advance further ended with a hard-fought drawn battle at Lundy’s Lane on July 25. The outnumbered Americans withdrew but withstood a prolonged Siege of Fort Erie. The British raised the siege, but lack of provisions eventually forced the Americans to retreat across the Niagara. Meanwhile, following the abdication of Napoleon, 15,000 British troops were sent to North America under four of Wellington’s most able brigade commanders. Fewer than half were veterans of the Peninsula and the remainder came from garrisons. Along with the troops came instructions for offensives against the United States. British strategy was changing, and like the Americans, the British were seeking advantages for the peace negotiations. Governor-General Sir George Prevost was instructed to launch an invasion into the New York-Vermont region. He had a large invasion force which was much more powerful than the Americans. On reaching Plattsburgh, however, he delayed the assault until the belated arrival of a fleet led by Captain George Downie in the hastily completed 36-gun “Confiance.” Prevost forced Downie into a premature attack, but then unaccountably failed to provide the promised military backing. Downie was killed and his naval force defeated at the naval Battle of Plattsburgh in Plattsburgh Bay on September 11, 1814. The Americans now had control of Lake Champlain; Theodore Roosevelt later termed it the greatest naval battle of the war. To the astonishment of his senior officers, Prevost then turned back, saying it would too hazardous to remain on enemy territory after the loss of naval supremacy. Prevost’s political and military enemies forced his recall. In London a naval court martial of the surviving officers of the Plattsburgh Bay debacle decided that defeat had been caused principally by Prevost’s urging the squadron into premature action and then failing to afford the promised support from the land forces. Prevost died suddenly, just before his own court martial was to convene. Prevost’s reputation sank to new lows, as Canadians claimed their militia under Brock did the job and he failed. Recently, however, historians have been more kindly, measuring him not against Wellington but against his American foes. 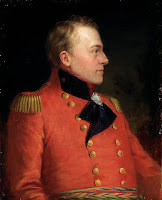 They judge Prevost’s preparations for defending the Canadas with limited means to be energetic, well conceived, and comprehensive, and against the odds he had achieved the primary objective of preventing an American conquest. Little of note took place on Lake Huron in 1813, but the American victory on Lake Erie isolated the British there. During the winter, a Canadian party under Lieutenant Colonel Robert McDouall established a new supply line from York to Nottawasaga Bay on Georgian Bay. When he arrived at Fort Mackinac with supplies and reinforcements, he sent an expedition to recapture the trading post of Prairie du Chien in the far West. The Battle of Prairie du Chien ended in a British victory on July 20, 1814. In 1814, the Americans sent a force of five vessels from Detroit to recapture Mackinac. A mixed force of regulars and volunteers from the militia landed on the island on July 4. They did not attempt to achieve surprise, and at the brief Battle of Mackinac Island, they were ambushed by Indians and forced to re-embark. The Americans discovered the new base at Nottawasaga Bay and on August 13, destroyed its fortifications and a schooner which they found there. They then returned to Detroit, leaving two gunboats to blockade Michilimackinac. On September 4, these gunboats were taken unawares and captured by enemy boarding parties from canoes and small boats. This Engagement on Lake Huron left Mackinac under British control. The British garrison at Prairie du Chien also fought off an attack by Major Zachary Taylor. In this distant theatre, the British retained the upper hand till the end of the war because of their allegiance with several Indian tribes that they supplied with arms and gifts. When the war began, the British naval forces had some difficulty in blockading the entire U.S. coast, and they were also preoccupied in their pursuit of American privateers. 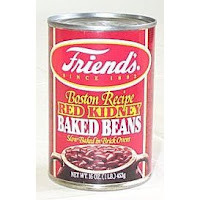 The British government, having need of American foodstuffs for its army in Spain, benefitted from the willingness of the New Englanders to trade with them, so no blockade of New England was at first attempted. The Delaware River and Chesapeake Bay were declared in a state of blockade on December 26, 1812. This was extended to the coast south of Narragansett by November 1813 and to all the American coast on May 31, 1814. In the meantime, much illicit trade was carried on by collusive captures arranged between American traders and British officers. American ships were fraudulently transferred to neutral flags. Eventually the U.S. Government was driven to issue orders to stop illicit trading. This put only a further strain on the commerce of the country. The overpowering strength of the British fleet enabled it to occupy the Chesapeake and to attack and destroy numerous docks and harbors. Additionally, commanders of the blockading fleet, based at the Bermuda dockyard, were given instructions to encourage the defection of American slaves. Many black slaves came over to the Crown, with their families, and were recruited into the (3rd Colonial Battalion) Royal Marines on occupied Tangier Island, in the Chesapeake. A further company of colonial marines was raised at the Bermuda dockyard, where many freed slaves, men women and children, had been given refuge and employment, and was kept as a defensive force in case of an attack. These former slaves fought for Britain throughout the Atlantic campaign, including the attack on Washington D.C.and the Louisiana Campaign, and most were later re-enlisted into British West India regiments, or settled in Trinidad in August, 1816, where seven hundred of these ex-marines were granted land (they reportedly organised themselves in villages along the lines of military companies). Many other freed American slaves had been recruited directly into existing West Indian regiments, or newly-created British Army units. From the probing of the British Colony of New Brunswick, Maine was an important conquest by the British. The line of the border between New Brunswick and the District of Maine had never been adequately agreed after the American Revolution. A military victory in Maine by the British could represent a large gain in territory for New Brunswick, but more immediately it assured communication with Lower Canada via the St John River and the Halifax Road. The war did not settle the border dispute, and when Maine became a state in 1820, it led to a border crisis called the Aroostook War. The border between Maine and New Brunswick was not be settled until 1842 and the “Webster-Ashburton Treaty”. In September 1814, Sir John Coape Sherbrooke led a British Army into eastern Maine and was successful in capturing Castine, Hampden, Bangor, and Machias. The Americans were given the option of swearing allegiance to the king or quitting the country. The vast majority swore allegiance and were even permitted to keep their firearms. This is the only large tract of territory held by either side at the conclusion of the war and was given back to the United States by the Treaty of Ghent. The British did not leave Maine until April 1815, at which time they took large sums of money retained from duties in occupied Maine. This money, called the “Castine Fund”, was used in the establishment of Dalhousie University, in Halifax, Nova Scotia. The strategic location of the Chesapeake Bay near the nation’s capital made it a prime target for the British. Starting in March 1813, a squadron under Rear Admiral George Cockburn started a blockade of the bay and raided towns along the bay from Norfolk to Havre de Grace.On July 4, 1813, Joshua Barney, a Revolutionary War naval hero, convinced the Navy Department to build the Chesapeake Bay Flotilla, a squadron of twenty barges to defend the Chesapeake Bay. Launched in April 1814, the squadron was quickly cornered in the Patuxent River, and while successful in harassing the Royal Navy, they were powerless to stop the British campaign that ultimately led to the “Burning of Washington”.This expedition, led by Cockburn and General Robert Ross, was carried out between August 19 and August 29, 1814, as the result of the hardened British policy of 1814 (although British and American commissioners had convened peace negotiations at Ghent in June of that year). As part of this, Admiral Warren had been replaced as Commander-in-Chief by Admiral Alexander Cochrane, with reinforcements and orders to coerce the Americans into a favourable peace.Governor-General Sir George Prevost of Canada had written to the Admirals in Bermuda calling for a retaliation for the American sacking of York (now Toronto). A force of 2,500 soldiers under General Ross, aboard a Royal Navy task force composed of the Royal Oak, three frigates, three sloops and ten other vessels, had just arrived in Bermuda.Released from the Peninsular War by British victory, it had been intended to use them for diversionary raids along the coasts of Maryland and Virginia. In response to Prevost’s request, it was decided to employ this force, together with the naval and military units already on the station, to strike at Washington D.C. On August 24, Secretary of War Armstrong insisted that the British would attack Baltimore rather than Washington, even when the British army was obviously on its way to the capital. The inexperienced American militia, which had congregated at Bladensburg, Maryland, to protect the capital, were destroyed in the Battle of Bladensburg, opening the route to Washington. While Dolley Madison saved valuables from the White House, President James Madison was forced to flee to Virginia. 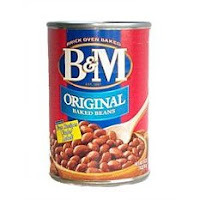 The British commanders ate the supper which had been prepared for the president before they burned the President’s Mansion; American morale was reduced to an all-time low. The British viewed their actions as in retaliation for destructive American raids into Canada, most notably the Americans’ burning of York (now Toronto) in 1813. Later, that same evening a furious storm swept into Washington D.C. sending one or more tornadoes into the city, causing more damage but eventually extinguished the fires with torrential rains. The naval yards were set afire at the direction of U.S. officals to prevent the capture of naval ships and supplies. The British left Washington D.C. as soon as the storm subsided. Having destroyed Washington’s public buildings, including the White House and the Treasury, the British army next moved to capture Baltimore, a busy port and a key base for American privateers. The subsequent Battle of Baltimore began with a British landing at North Point, but withdrew when General Ross was killed at an American outpost. The British also attempted to attack Baltimore by sea on September 13 but were unable to reduce Fort McHenry, at the entrance to Baltimore Harbor. The Battle of Fort McHenry was no battle at all. British guns had range on American cannon, and stood off out of U.S. range, bombarding the fort, which returned no fire. Their plan was to coordinate with a land force, but from that distance coordination proved impossible, so the British called off the attack and left. All the lights were extinguished in Baltimore the night of the attack, and the fort was bombarded for 25 hours. The only light was given off by the exploding shells over Fort McHenry, which gave proof that the flag was still over the fort. The defense of the fort inspired the American lawyer Francis Scott Key to write a poem that would eventually supply the lyrics to “The Star-Spangled Banner”. In March 1814, Jackson led a force of Tennessee militia, Cherokee warriors, and U.S. regulars southward to attack the Creek tribes, led by Chief Menawa. On March 26, Jackson and General John Coffee decisively defeated the Creeks at Horseshoe Bend, killing 800 of 1,000 Creeks at a cost of 49 killed and 154 wounded of approximately 2,000 American and Cherokee forces. Jackson pursued the surviving Creeks until they surrendered. Most historians consider the Creek war as part of the War of 1812, because the Indians were a cause and the British supported them. On December 24, 1814, diplomats from the two countries, meeting in Ghent, United Kingdom of the Netherlands (present Belgium), signed the Treaty of Ghent. This was ratified by the Americans on February 16, 1815.Unaware of the peace, Jackson’s forces moved to New Orleans, Louisiana, in late 1814 to defend against a large-scale British invasion. Jackson decisively defeated the British at the Battle of New Orleans on January 8, with over 2000 British casualties and fewer than 100 American losses. It was hailed as a great victory, making Andrew Jackson a national hero, eventually propelling him to the presidency. The British gave up on New Orleans but moved to attack the town of Mobile. In the last military action of the war 1000 British troops won the battle of Fort Bowyer. When news of peace arrived on February 13 they sailed home. The campaign was to be the last time the United States was directly attacked by another country until the attack on Pearl Harbor on December 7, 1941 during World War II.The terms of the treaty stated that fighting between the United States and Britain would cease, all conquered territory was returned to the prewar claimant, the Americans received fishing rights in the Gulf of St. Lawrence, and that both the United States and Britain agreed to recognize the prewar boundary between Canada and the United States.The Treaty of Ghent, which was promptly ratified by the Senate in 1815, said nothing at all about the grievances that led to war. Britain made no concessions concerning impressment, blockades, or other maritime differences. Thus, the war ended in a stalemate with no gain for either side. This was a war in which no territory was lost nor gained by either side. None of the points of contention were addressed by the Treaty of Ghent, yet it was a war that changed much between the United States of America and Great Britain. The Treaty of Ghent established the status quo ante bellum; that is, there were no territorial changes made by either side. The issue of impressment was made moot when the Royal Navy stopped impressment after the defeat of Napoleon. The US ended the Indian threat on its western and southern borders. The nation also gained a psychological sense of complete independence as people celebrated their “second war of independence.”. Nationalism soared after the victory at the Battle of New Orleans. The opposition Federalist Party collapsed and an Era of Good Feelings ensued. The United States no longer questioned the need for a strong Navy and indeed completed three new 74 gun ships of the line and two new 44 gun frigates shortly after the end of the war. (Another frigate had been destroyed to prevent it being captured on the stocks). In 1816 the U.S. Congress passed into law an “Act for the gradual increase of the Navy” at a cost of one million dollars a year for eight years authorizing nine ships of the line and 12 heavy frigates. The Captains and Commodores of the U.S. Navy became the heroes of their generation in the United States. Decorated plates and pitchers of Decatur, Hull, Bainbridge, Lawrence, Perry and Macdonough were made in Staffordshire, England, and found a ready market in the United States. Three of the war heroes used their celebrity to win national office: Andrew Jackson (elected president in 1828 and 1832), Richard Mentor Johnson (elected vice president in 1836), and William Henry Harrison (elected president in 1840). The New England states became increasingly frustrated over how the war was being conducted, and how the conflict was affecting their states. They complained that the United States government was not investing enough in the states’ defenses both militarily and financially, and that the states should have more control over their militia. The increased taxes, the British blockade, and the occupation of some of New England by enemy forces also agitated public opinion in the states. The War of 1812 was seen by the people in British North America, and later Canada, as a reprieve from an American takeover. The outcome gave Empire-oriented Canadians confidence and, together with the postwar “militia myth” that the civilian militia had been primarily responsible rather than the British regulars, was used to stimulate a new sense of Canadian nationalism. A long-term implication of the militia myth that remained popular in the Canadian public at least until World War I was that Canada did not need a regular professional army. The Battle of York demonstrated the vulnerability of Upper and Lower Canada. In the 1820s, work began on La Citadelle at Quebec City as a defence against the United States. The fort remains an operational base of the Canadian Forces. In the 1820s, work began on the Halifax citadel to defend the port against American attacks. This fort remained in operation through World War II. In the 1830s, the Rideau Canal was built to provide a secure waterway from Montreal to Lake Ontario avoiding the narrows of the St. Lawrence river where American cannon could block traffic. The British also built Fort Henry at Kingston to defend the Rideau Canal. This fort remained operational until 1891. Bermuda had been largely left to the defences of its own militia and privateers prior to American independence, but the Royal Navy had begun buying up land and operating from there in 1795 as its location was a useful substitute for the lost American ports. It originally was intended to be the winter headquarters of the North American Squadron, but the war shoved it into a new prominence. As construction work progressed through the first half of the century, Bermuda became the permanent naval headquarters in Western waters, housing the Admiralty, and serving as a base and dockyard. The military garrison was built up to protect the naval establishment, heavily fortifying the archipelago that came to be described as the Gibraltar of the West. Defence infrastructure would remain the central leg of Bermuda’s economy until after the Second World War. The war is scarcely remembered in Britain  because it was overshadowed by the far larger conflict against Napoleon Bonaparte. Britain’s goals of impressing seamen and blocking trade with France had been achieved and were no longer needed. In the early years of the nineteenth century, the Royal Navy was the dominant nautical power in the world.. They used their overwhelming strength to cripple American maritime trade and launch raids on the American coast. However, the Royal Navy was acutely conscious that the United States Navy had won most of the single-ship duels during the War. The causes of the losses were many but among those were the heavier broadside of the American 44 gun frigates, and the fact that the large American crews were hand-picked from among 55,000 unemployed merchant seamen in American harbors. The United States Navy had 14 frigates and smaller ships to crew at the start of the war, while Great Britain maintained 85 ships in North American waters alone. The crews of the British fleet which numbered some 140,000 men were rounded out with impressed ordinary seamen and landsmen. In a order to his ships, Admiral Warren ordered that less attention be paid to spit and polish and more to gunnery practice. It is notable that the well trained gunnery of HMS Shannon allowed her victory over the USS Chesapeake. 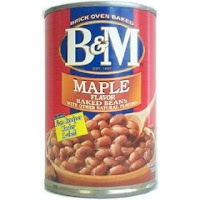 ^ See http://www.geocities.com/Pentagon/Camp/7624/Warof1812.htm – sources at bottom. British and American forces also suffered 3,679 and 4,505 wounded, respectively. It is noteworthy that these “official” figures do not include losses to disease, casualties among American or Canadian militia forces, or losses among allied native tribes. ^ American Military History, Army Historical Series, Ch. 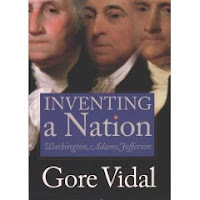 6, p. 123, states “While the western “war hawks” urged war in the hope of conquering Canada, the people of Georgia, Tennessee, and the Mississippi Territory entertained similar designs against Florida, a Spanish possession”. ^ American Military History, Army Historical Series, Ch. 6, p. 123. ^ Hansard, vol 29, pp.649-50. POTSI: American War of 1812. Partial list of Bermudian-built Royal Naval vessels. From The Andrew and the Onions, by Lt. Cmdr. I. Strannack. whats the point of that? did the americans and canadians become friends after the war? ?